Located on the Pacific Ring of Fire, Taiwan is an island formed by the continental collision of Philippine Sea Plate and Eurasian Plate. Due to this geological background, the land area of Taiwan is majorly covered by mountains and hills. According to the official data from Taiwan government, around 70 percent land area of Taiwan is over 100 meters above sea level, and there are also more than 200 mountains that the peak is over 3,000 meters above sea level. The harsh physical environment strongly influences the lifestyle of Taiwanese people, especially who live in mountainous regions. People lived in these areas must spend extra time and cost to get adequate food, water, and other services, like banking and education. Furthermore, most of them are the aborigines of Taiwan, which are rather socially and economically vulnerable groups in contemporary society. It is even more challenging for them to make a decent living. As a result, since 2010, Taiwan government has started the subsidies that aim to reduce the fuel cost for the residents in remote villages. As mentioned in the scenario, the residents of remote villages can receive the subsidies for fuel cost after providing receipts or invoices to the local government. The budget is supplied by the Bureau of Energy, Ministry of Economic Affairs. To further understand the optimal rate for the fuel subsidies, the Bureau of Energy has cooperated with the think tank – Taiwan Research Institute to calculate the actual cost from each remote village to its nearby gas stations. The result of this research project could help the government to estimate and distribute the budget more reasonably. Since the terrain is never flat and even in the mountains, the roads are often winding and have many curves, resulting in serious bias in calculating the road length if users measure it as straight lines. 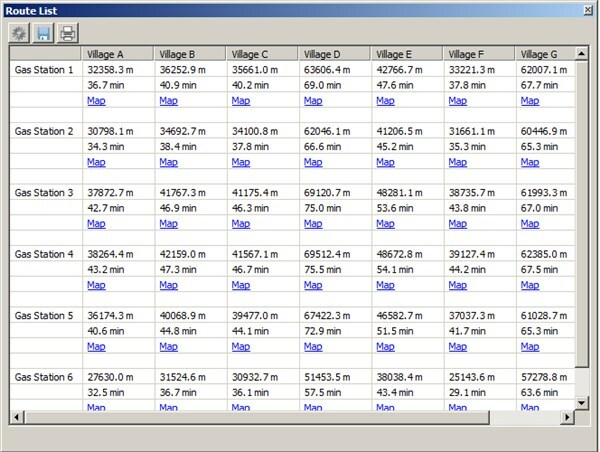 To calculate the distance between villages and gas stations more accurately, users should analyze as a network in GIS. Developed by Supergeo Product Team, SuperGIS Desktop and the extensions are multifunctional, affordable, and robust GIS software that can help users to solve problems from various domains. Accordingly, Taiwan Research Institute has selected SuperGIS Desktop and its extension – Network Analyst to achieve its goal. 1. 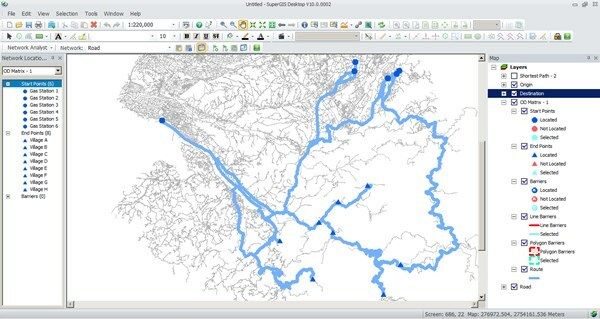 To conduct a network analysis, users must convert the road layer, generally stored as line features, to the network data. 2. After the road network in the designated region is created, analysts can import the gas stations and the targeted villages as “stops” and find the shortest path between them. 3. Since a gas station might serve many villages and vice versa, the analysts conducted the one-to-many and many-to-one functions and recorded these results as an O-D matrix for further comparison. After finishing these steps, the researchers have acquired the detailed information about the actual time and distance from each village to nearby gas stations. Then users just have to do simple arithmetic with the current price of fuel, and the total budget for the subsidies can be estimated and adjusted in a more precise and realistic way. In short, Network Analyst do help the government to allocate the budgets for these remote villages more appropriately. 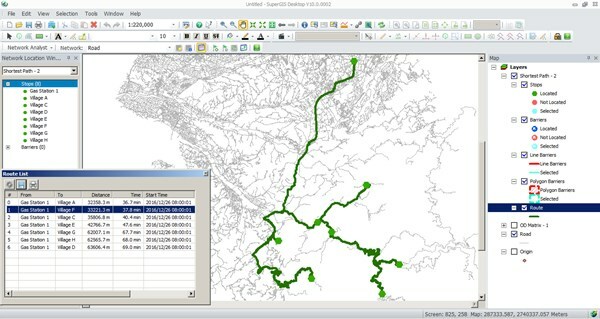 The Network Analyst of SuperGIS Desktop is a practical and ideal tool for solving various network problems. To make the results more realistic, this powerful extension also has many flexible settings. For example, users can further classify the roads as highways, major roads, and alleys and give them different weights, set the time for changing direction, and create barriers to prohibit using certain road sections. Moreover, in the latest version – SuperGIS Network Analyst 10, the O-D matrix is already a built-in function. Therefore, users no longer need to record and organize the data with other software, speeding up the process of complex network analyses.